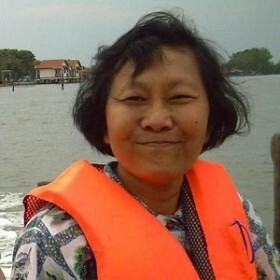 Dr. Sansanee Choowaew’s research areas of interest are natural resource management; rural land use modeling, planning and policy making; and wetlands-related issues including ecosystems management, biodiversity conservation, restoration, poverty alleviation, wise use of wetland resources, functions and values of rural and urban wetlands, and wetland education and communication. She has been involved with a series of wetland management projects and programs in Thailand and has over 20 years experience in wetland issues of the Mekong River Basin. Recent research projects focused on social and economic aspects of fisheries within riverine ecosystems impacted by hydropower development projects; on riverine floodplains and flooded forests; on biodiversity conservation in rice fields; on freshwater marsh management planning; and on linkages between wetlands, water and climate change, assessments of impacts, vulnerability and adaptations to hydrological changes and natural aquatic system alteration, especially ecological and socioeconomic aspects in the Mekong region. On-going research activities are participatory research for conservation and wise use of wetland resources; future changing climate factors and wetland ecosystems’ impacts, vulnerability and adaptation; impacts of alien invasive species (Mimosa pigra) on local traditional irrigation systems; persistent organic pollutants in wetland soils and their consequences to ecosystem services; and the role of wetland related culture in sustaining people’s livelihoods, food and water security and local economy.